We’ve got a new leader in the WordPress themes review category and their leader is now Thrive Themes. The primary reason we decided to give this company the #1 diamond nod is because their themes allow any webmaster the tools and resources to turn their WordPress website into a conversion-optimized machine. It doesn’t matter what type of website you run, there’s likely something there that you want people to take action on. Whether it be to join your mailing list, buy your widgets or click an affiliate link. With Thrive Themes, everything you could possibly want to do with your content is available at your fingertips without having to hire a developer or designer. Let’s dive in and see what Thrive Themes has to offer. Thrive offers fantastic support from what we’ve personally experienced. They offer an easy page builder, offers stunning modern designs, highly optimized for conversions, pre-built landing pages, opt-in overlays with multiple options and much, much more. Although you can order their themes on an individual basis for $49, your theme won’t come with the awesome Thrive Content Builder, landing pages, thrive leads or the other excellent plugins. In order to get these features, you’ll need the thrive themes membership starting at $147. We fell in love with Thrive Themes so much that we currently use a customized version of their themes on this website. The owner, Scott Buehler, also uses these themes to power client websites that focus on getting conversions (phone calls, opt-ins, walk-ins and purchases of products). Of course, these are just the main page, what’s most important is the inner content and how that is displayed. For that, we invite you to view the full theme demos using the button below. All themes include automatic image compression. You can ditch those image optimization plugins, some of which are premium that cost additional money to use. Use the powerful built-in conversion focus areas to boost your conversions. Add opt-in forms, call-to-actions and whatever else you want. As shown, these are the options available when you make a new focus area. As an example, you can use “below post” to add an opt-in to readers when they read an entire blog post on your website. You can use this to increase your in-content conversions on your mailing list or use the other provided templates to add a call to action like “buy this widget” or “download our report.” Besides all of the color options they provide, you can also build your own custom design. Display these on the top section of your website, below your post content (posts or pages) or on your main blog page between posts. All of these selections have options that allow you to further customize how or where the content is displayed. 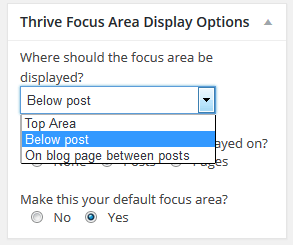 Example: On “below post” you can specify your focus area to display site-wide as a default focus area or you can select specific categories. We’ve tested and played around with hundreds of themes and the way Thrive handles page generation is the easiest and non-obtrusive page build-out we’ve seen. We’ve used other themes where you have to import a file, or if you click a button, it forces you to build 10+ pages and posts all at once. 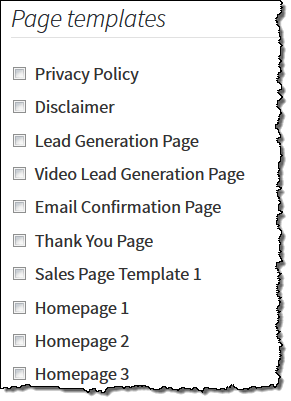 With Thrive Themes, you simply check the boxes of the pages you’d like to have automatically build for you and then click “Generate Selected Pages” and you are off to the races. As for what the pages look like, definitely take a look at the theme demos in the orange button above because each theme builds these pages differently. 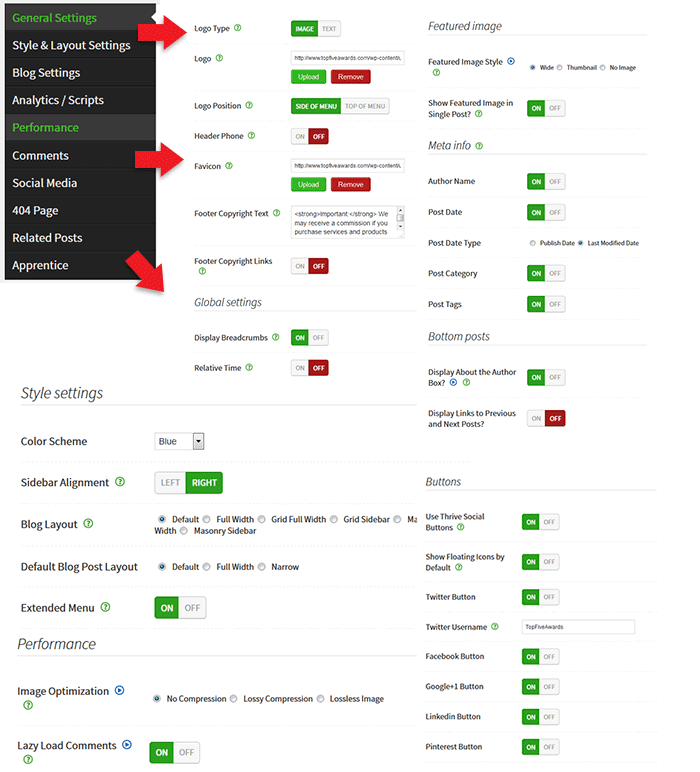 If you’ve browsed the theme and all pages, you’ll have a clear example of the quality pages that you can build and customize. From sales pages, opt-in pages to email confirmations, you will be on your way to boosting sales and conversions. One of our favorite features is the fact that local and Internet businesses were thought of with their themes. You can easily add a click-to-call phone number, add countdown timers and much more to help your business encourage visitors to call or take an action that you want. Additionally, all themes are mobile optimized. All themes do an amazing job displaying your website for mobile and desktop users alike. When you take advantage of post shortcodes and other features, you’ll notice that they all react to small-width and wide width browser settings without any surprises. We’ve been pleasantly surprised with everything we’ve tested to this point. We’ve been developing Top Five Advisor on the FocusBlog template that we’ve customized. Within 2 months, we’ve seen 4 updates to the parent theme which is unheard of. Most of the time, they are either adding features or fixing bugs that their users have reported in their forums / ticket submission area. 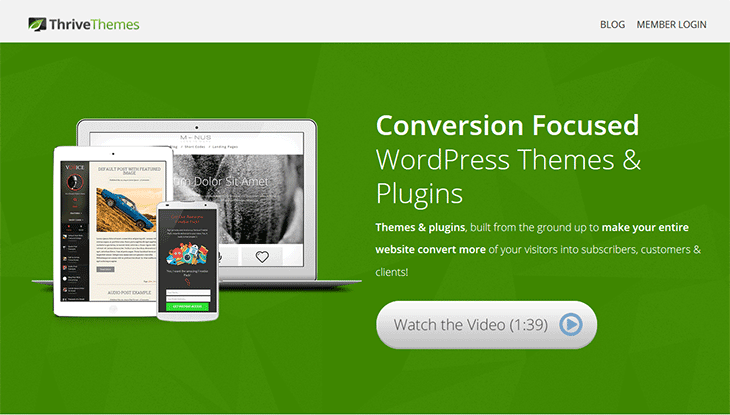 You will likely notice that using their themes, you will quickly cut down a lot of the plugins you are using. The themes all come with built-in features that are sure to impress. Here’s a collage of feature options we put together for you. Keep in mind these are theme options for the FocusBlog theme, however, in our experience, the other themes have similar settings available. Google Fonts are built in to each theme and are available for use on your website. Powerful icon library. You’ll use icomoon.io to build your own custom list of icons and import them into your thrive theme. These means that you won’t need a massive font file that will decrease page load times. You’ll load the icons you want and build your own custom optimized font that doesn’t waste space. Uses the native WordPress gallery and displays it beautifully (used in our theme gallery above). As you can see, there’s lots to play around with and use on your website. Of course, I had to show off a little bit and display a “Page Section” with various features just so you can just a touch of what is possible first-hand. Hurry: This Gadget Goes Off the Shelf Soon! The Time Has Run Out! As you can obviously see here, there’s just a lot of great things you can use here to help you drive readers’ eyeballs where you want it. The shortcodes we used to build the above are: page section, divider (left), drop caps (box), highlight, headline focus, number counter and opt-in. Do you love using widgets in your WordPress sidebar? Of course you do! They get people to click around on your website which can help your site’s visitors find the content that they are looking for. Above we provided a screenshot of their widgets in the FocusBlog theme along with their descriptions. Just looking that over, you should start getting ideas on how to use these widgets to enhance your website. Take Widgets to the Next Level! Under any widget that you add, you are going to see a green icon with a link “Thrive Widget Display Options” which will present you with the screen above. What’s really awesome about this is you can display a widget to specific categories, posts, pages and more. Or, you can default a widget to display on all posts, pages or even on your custom post types. If you browse around on Top Five Advisor, you might stumble upon how we use this display logic in various sections to help draw traffic to certain pages or to make special offers to visitors of a category. Very powerful stuff. We were able to delete all social media plugins and use Thrive’s integration with success. The only issue we had with the social media flare counter because the font was way, way too big, especially on some of our pages that were shared heavily. However, with a quick support request in their forum, they provided a custom CSS solution that works to fix this. Obviously, you can change the font size to whatever works best for your website. You’ll be able to use a hybrid social share bar that floats when a user’s browser is wide enough or it will dock to the bottom of your content. I really loved this feature and decided to stick with it. There’s also the Thrive “Follow Me Widget” which allows you to integrate social icons on your sidebar. The Thrive Content Builder is an add-on plugin that you can install as part of your thrive membership and is accessible within any page, post or custom post type on your WordPress website. After installing your Thrive theme and installing this plugin, you will see the “Edit with Thrive Content Builder” button to use. Note: It is important to understand that your TCB content and your WordPress editor content is kept separate in order to avoid conflicts. If you want to use TCB on a particular page or post, content that you write in the regular editor will not be displayed. We haven’t dug too far into the lightboxes yet, but here’s the rundown on how these feature works. We’re sure you’ve seen certain sites offer you a pop-over when you first visit their site that is within the same page (it darkens the content behind and displays over the content). You can do this same effect on your site with Thrive Themes right out of the box. In order to make Lightboxes work, you need to use TCB, not the regular WordPress editor (this post was written in the regular editor using shortcodes). You can create on-click lightboxes that will appear when someone clicks a link or button, you can have lightboxes appear when someone attempts to exit the page (exit intent), or you can have them display after a certain amount of time (or instantly on page load) if you want. Besides when and where they appear, you can also customize the animation used to display the lightbox on your page. We plan on using these to offer promotions and increase our opt-ins here at Top Five Advisor in the near future. Has This Review Helped You? Please leave a comment below and let us know how we’re doing. If you have any questions, please feel free to ask and we will answer them to the best of our knowledge (or research the answer for you).